We are really just guessing what this is all about, but we figure it was someone being welcomed to Perth. Our Bosinan sources tell us that the translation of "Dobra Dosla" is welcome to a female, rather than a male. The message also proclaims in large letters "MNJAUUU". Randomperth has unsuccessfully tried to decipher whether this is the name of the person being welcomed or a reference to something else. Anyhow, if you know what this is about, please let us know. Today Eliza is seemingly celebrating a massive win by Mexico against the global soccer giants, Brazil, in the Olympic gold medal match last month. We can only presume this because a cursory google search revealed no other London gold medal wins for the land of Corona and Quesadillas. Mexico scored two goals against the one by Brazil, who has won five of the nineteen FIFA World Cup Tournaments that have been played. Mexico, who hosted the Cup tournament in 1986, has never won it. We are just pleased that Eliza was around to help celebrate a massive Olympuic win by a country whose food sits right at the very heart of many domestic and commercial kitchens in Perth. So Eliza has turned in her speedos for a mortar board and gone all nerdy on us. Randomperth offers up our hearty congrats to the lucky guy or gal who has just completed a gruelling university stint to secure their doctorate of philosophy (PhD). You can tell that this stunt was pulled by an intellectual giant because of the play on words in their clebratory message ... "Phinished". So the lucky Phinisher will henceforth be known as Doctor Soandso. A real doctor. Not like those Phraudsters who call themselves "doctor" after simply completing a medical degree. So if you are the successful Phinisher who has pulled this little nerdy dress-up stunt, please tell us about yourself and on what topic you have dedicated yourself to for the past four years or so of your life. Randomperth (not known for its soccer knowledge) understands that Chelsea's win in the GF of the UEFA Champions League is the first time for a London club. After Bayern Munich took the lead 82 minutes into the game, that cunning little fella Didier Drogba netted his ninth goal in nine cup finals with two minutes left to play. Chelsea saved a penalty in extra-time, so it became a shoot-out. After one miss apiece, Bastian Schweinsteiger (BM) struck woodwork, allowing Drogba to step up and slot one home to win the competition. Plenty of stuff on the net if you're interested, but here are the Video highlights. Estelle and Paul knotted at last! Randomperth congratulates Estelle and Paul on their nuptials. If you look closly, under the veil, Eliza can be seen with a big grin on her dial. She was, however, just a bit upset that she never got a gig to the reception! Shame on you Estelle and Paul. 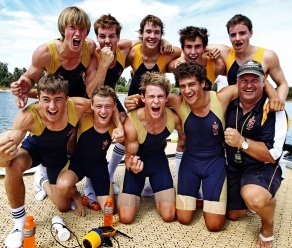 "Christ Church have retained their crown as WA's premier rowing crew at the annual Public Schools' Association head of the river regatta at Champion Lakes in Armadale. Competing in the blue riband first eight against six other PSA schools, Christ Church rowed a perfectly executed race taking the lead early and upping the stroke rate to win by almost a length in 5 minutes 53.8 seconds. Scotch, who had challenged from the start before finally being broken at the 1000m mark, finished second in 5:56.6 followed by Trinity, Guildford, Aquinas, Wesley and Hale." Sorry. Did they say Hale in last place? So hats off to the Hale boys for having a laugh at their own expense. Or maybe it was the girlfriends of the team trying to disgrace them into becoming real men. The main photo of Eliza captures some speedboat in the background just to give the Hale boys some idea of what power really is. In the end, who knows why Hale rowing is on show. But its a laugh none the less. This one is more difficult to interpret than most. Clearly we are in the 11th week of 2012, providing you assume that Sunday January 1 was not the end of the first week. Better stay away from this debate or we will re-ignite whether it is in fact 2012 or 2011 or 2013, depending on when you believe the new millenium began. So the Randomperth theory is that week 11 has something to do with the University of Western Australia Guild, which ... "runs a diverse range of Theme Weeks throughout the year. These are organised by Subsidiary Councils and Guild Departments with help from the Public Affairs Council." Week 11 in 2012 is themed Multicultural Week and is organised by the International Students' Service (ISS) and the Aboriginal Torres Strait Island Student Department (ATSIS). The website (http://www.guild.uwa.edu.au/home/activities/theme_weeks) says that MCW highlights the diverse cultural representation on campus. The week culminates in the much anticipated 'Spring Feast' in Guild Village. Let's hope Randomperth gets an invite to it through this big internet promotion! The talented bunch at St Hildas stole the coveted inependent girls' schools swimming title last night at Challenge Stadium. Mysteriously, Eliza learned about this crushing triumph overnight and donned the school's swimming regalia to celebrate the occasion. Well done girls and send us some photos of the night. Almost as soon as the St George's "O - week" sign was up, it was removed ... presumably by the mob who replaced it with this blue and yellow polo / sport shirt. Unfortunately, our photo gear wasn't up to the task of identifying the logo and wording on the shirt, so we are in the dark about its intent. One theory is that the shirt reflects the Eagles victories in the NAB Cup opener last night. If you know what the intent is, then please enlighten us. Either way, its great to see Eliza getting dressed up so regularly now that uni holidays are over. Keep it up. The crazy kids from St George's College (University of Western Australia) have been the latest to commandeer Eliza to advertise "O" week (orientation week), when new students are shown all of the critical skills they will need to navigate their new learning environment, such as drinking half yard glasses full of warm beer, partying all night and then scoffing pills to keep awake the next day (while their lecturers drone on about the importance of class attendance) and most importantly ... when is the first toga party of the year. If you're a St George's College resident or used to be, let us know. And if you're in charge of the O week celebrations, keep us updated about what's happening. And for all you new tertiary students, whichever university you belong to, we wish you the best of luck and happiness on behalf of our mate, Eliza.